The United States of America (USA) celebrates its independence every 4th of July each year to commemorate the independence of the country. Independence Day, commonly known as the Fourth of July or July Fourth, is a federal holiday in the United States commemorating the adoption of the Declaration of Independence on July 4, 1776, declaring independence from Great Britain. It is the National Day of the United States which is associated with several activities to commensurate the celebration. Events such as fireworks, parades, barbecues, carnivals, fairs, picnics, concerts, baseball games, family reunion and political speeches and ceremonies are organized in the USA and other places where friends of the United States and associates identify with a nation that embodies the tenets of freedom. It also offers an opportunity for friends of the country to identify with the aspiration and history of the country. As a celebratory focused event, partners in different countries play host with different activities to commemorate with the US of A. This comes with the benefits that embrace cross cultural appreciation, fostering of friendship and business ties. The USA Consulate has endorsed this event, and will be supporting in spreading the news of invitees and the entire American Community in Lagos and Nigeria. 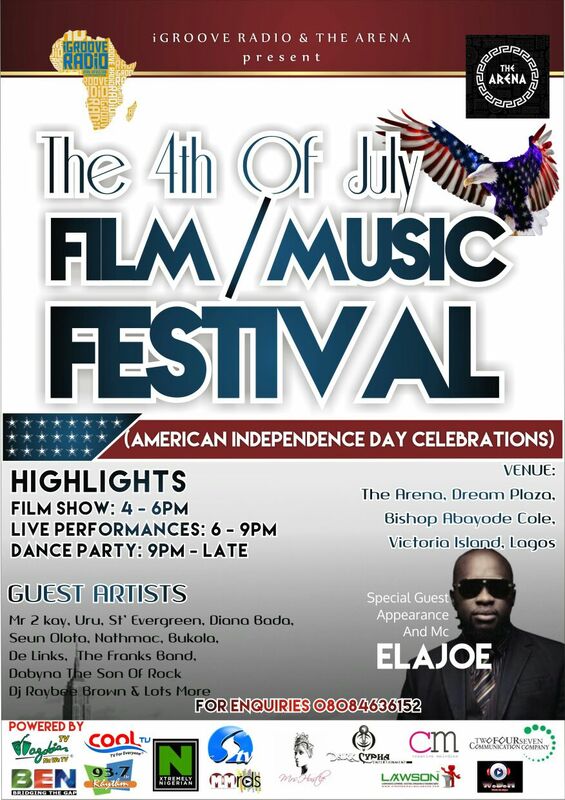 The Independence Day Film/ Music Festival and Dance Party/ Show will be an invitation based event. It is planned for tomorrow, Saturday, 4th July, 2015, at The Arena, Dream Plaza, Bishop Abayode Cole, Victoria Island. To celebrate a great country through social programs and events in Nigeria, and contribute to the many activities that will be anchored on that day. To create a networking platform for business people and friends of the USA to engage in a relaxing atmosphere as a means to enhance business relationship between the United States of America and Nigeria. To unveil a platform for brands and companies to showcase their different services and products. Highlights of the celebration/show are as follows. With special guest appearance by HipHop Legend/ Entrepreneur, Elajoe who will also be the M.C for the event. The partnership and team of IGrove Radio, TwoFourSeven Communication Company, Creative Melodies, MMRDS; and the supports of Dark Cypha Entertainment, MrsHustle Magazine, Silverbird TV, Rhythm 93.7 FM, Nigezie TV, BEN TV UK, Whats Da Hype UK, Cool TV UK, Wazobia TV, TheArena, are organizing the 4th Of July Independence Day Dance Party and Show.